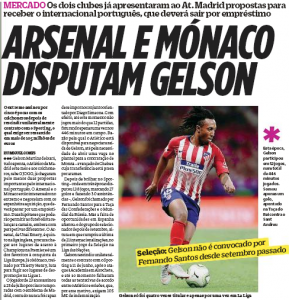 A big article from O Jogo this weekend claims Arsenal and AS Monaco are tussling to sign Gelson Martins from Atletico Madrid before the end of January. Gelson rescinded his contract with Sporting following attacks at the Lisbon club’s training ground, and signed for Atletico as a free agent. It’s similar to how Rui Patricio joined Wolves, but Nuno Espirito Santo’s side came to an agreement with Sporting, paying a transfer fee for the player. Atletico and Sporting haven’t reached the same, and the Portuguese club are looking for more than €100m in compensation. That’s one for the courts, but on the pitch Gelson hasn’t managed to shine, making a winter exit possible. Given Arsenal’s financial situation it would be a surprise for them to sign the player, but O Jogo say, according to their own information, that both the Gunners and Monaco have made ‘important proposals’. Any move would be on a loan basis, and help Atletico free up spaces in their squad as they look to complete a deal for Alvaro Morata.